I never would have known that a weekend getaway with some old friends and a few strangers could make me love Palawan even more. Our island is known for world-renowned pristine beaches, unique wildlife and lush forest, but last weekend, a day of the daring climb and chasing waterfalls in Bataraza brought us to one of the most stunning waterfalls in the province – the Lalatuan Falls. Composed of some fellow mountain trekkers, adventure seekers, and curious new wanderers, our team of 13, together with Batarazas tourism officer and local guides started our four-hour six-water falls hike from the humble feeder road in Barangay Malihud in the outskirt of the town center. Along the trail is a small Tagbanua village where visitors are required to register. Then team then resumed an easy hike, passing through paved pathways dotted with small chutes, rocks, and rivers. Summer is approaching and the trail is quite safe for trekkers, should it had been raining then, the trek will be slippery. With small happy talks and chill vibes, we reached the first cascade – the Kapangyan Falls. The team then left Kapangyan and resumed the hike along the river, occasionally holding on the crevices of large rocks and shallow cliffs, skipping to the next dry surface our feet could reach. Some of our team members braved to jump the cliff to plunge into the clear sapphire waters of a river near the Pabatingan and Zigzag waterfalls. From then on, a soft splash of water and cheerful banter of children jumping to the lagoon led us to another cascade – the Patunton Falls. Joined by the kids, our team then threaded to the wider part of the riverwith larger rocks and higher cliffs dotted with ferns, wild alocasia and begonias patiently clinging to the fissures. The looming trees seem to fence the river, vines dropping from above its lush green canopy enticed the team to hold onto it and jump into the opposite side of the stream… and deep into the lowlands of Mt. Mantalingajan Mountain Range, we were once again surprised by another cascade, soft tiny drops falling from the cliff, dispersing as it hits the large trunk leaning unto the precipice – the rain shower. If you fall, fall majestically and yes, some things have to fall to be beautiful – this is how Lalatuan falls is, regal yet stunning. 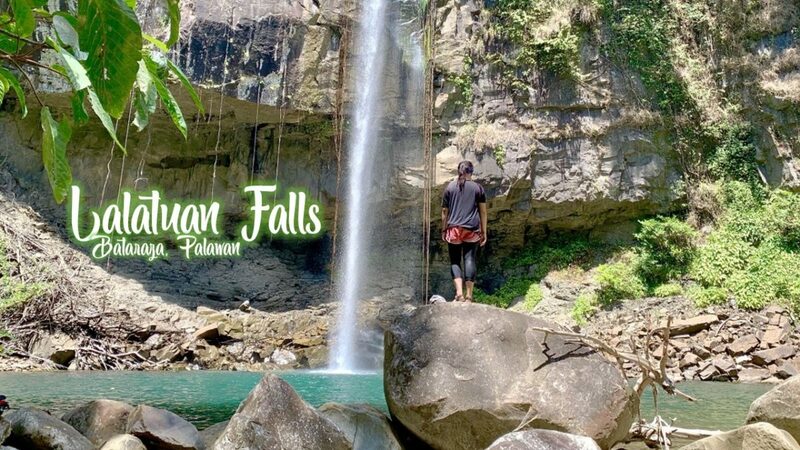 Approximately 50 meters high, Lalatuan, the last stop of the chasing waterfalls adventure in Bataraza, is a picture of serene beauty perched in the middle of the forest surrounded by rich flora. The soft fall of the waters contrasted the strength of the rocks around it and the lagoon is a depiction of a lovely dream – deep, calming, and something you’d want to remember when you go back to the reality. Bataraza is located five to six hours south of Puerto Princesa City. It can be reached via private, self-drive and public utility vehicles. To commute, take a tricycle or multi-cab to San Jose Terminal and board a Roro/Cherry Bus or van to Rio Tuba – just ask the driver to drop you in the towns newly constructed market to make arrangements with the guide. If you want a day tour, opt for private or self-drive vans and leave Puerto Princesa City after midnight to reach the town very early in the morning and return in the afternoon. If you wanted to spend a night in Bataraza, commuting is a great option. This chasing waterfalls adventure in Bataraza can be done in a day but make sure to bring your power bank, dry packed assault bag, charging cords, sunblock, Identification cards, first aid kit, money, lunch, water/ water bottle. You may wear an easy dry clothes, trekking sandals or shoes, and cap – some of the section of the trails are quite unshaded. Do not brave this adventure without a proper guide, contact the acting Municipal Tourism Officer, Mr. Jun Dawili at +63955-356-4190 for proper coordination and legit guides in the area. Let us avoid single-use plastics – opt for refillable water bottles, lunch boxes and reusable straws – lets start with the basics.